We are delighted to present the details for The Old Laundry 3 ideal for a cottage holiday in Keswick, Cumbria. To book or find out more please use the Booking Info or Availability buttons below. Superb 2 bedroom maisonette in new purpose built development, with roof terrace and secure parking. The Old Laundry 3 sleeps up to 4 people so could be perfect for your family or group. So if you are looking for a family holiday in Cumbria then The Old Laundry 3 could be just the ticket. 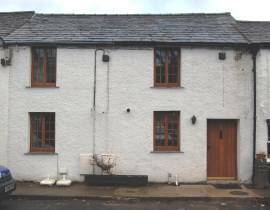 The Old Laundry number 3 is a two bedroom maisonette situated on the first and second floors of a converted building, a two minute stroll from Keswick town centre with all its amenities. It is furnished and equipped to a high standard and has the advantage of lift or stair access. It also has the rare advantage of secure garaged parking and a timber decked roof terrace providing extra space with privacy. With the benefit of a bike storage area as well this is the ideal accommodation whatever your plans. Lounge/Diner: Open plan with oak flooring, TV, DVD, CD radio and patio door to large roof terrace. Kitchen area: With electric hob and double electric oven, washer/dryer, fridge/freezer and microwave. Second Floor: Bedroom 1: With double bed. Bedroom 2: With twin beds, TV and DVD. Bathroom: With bath, shower cubicle, WC and wash basin. All fuel and bed linen included. Cot available. Please be aware that this property does not accept pets, however occasionally the owner may take their own pet and so we cannot guarantee the property will be totally pet free for allergy sufferers.Outside: Roof terrace with table and chairs, garaged ground floor parking for 1 car and storage for bikes. As you can see The Old Laundry 3 is located in a great location. The perfect base for any holiday around Keswick. And well suited to explore the whole of Cumbria. There are plenty of great places to vist near The Old Laundry 3. Take a look at out holiday ideas pages for details of many places that are well worth considering visiting whilst on holiday at The Old Laundry 3. A luxurious, first floor apartment within walking distance of the town centre with fell views and private parking.